Warm, revealing and often surprisingly funny portrait of an unlikely artist shows us that true talent will always refuse to be stifled, and you do not need an education to channel your emotions into art. 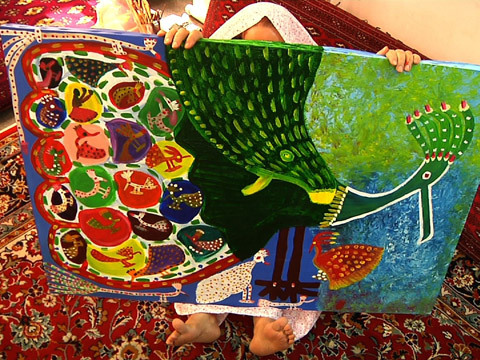 Akram is an illiterate, fifty-year-old Iranian woman who became a painter unexpectedly when her young grandson asked her to work on a drawing. That simple moment tapped into an explosion of powerful, primitive and colorful paintings, which she hid from disapproving eyes. When invited to exhibit in Paris, she is at the mercy of her conservative husband: Will he let her go showcase her raw talent or give in to his sense of tradition and keep her home? Rokhsareh Ghaemmaghami has a BA in cinema and an MA in animation. She has conducted research on “animated documentary,” and Cyanosis is her work for her MA degree. She has edited and made documentary films since 2000. Eshgh bazi is a 20-minute documentary film made in 2001 about competitions of pigeon fanciers in Tehran. After two years of working on her MA thesis, “Documentary Animation,” her first book with the same title will be published in Persian. Among her awards are the Best Documentary Award from the Tehran 12th International Film Festival, the Best Film Award from the 4th Singapore Short Film Festival, and the Merit of Jury and the Audiences Award from the 38th Tampere International Short Film Festival.